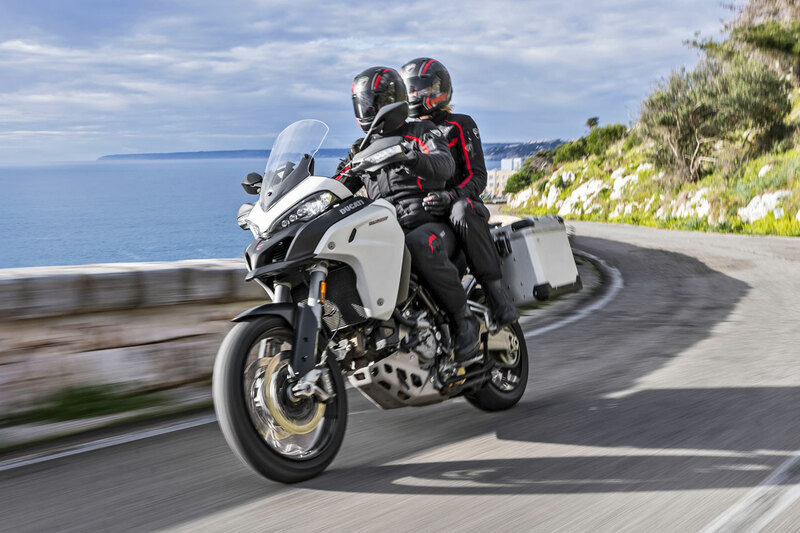 The standard high-tech equipment featured on the new Multistrada 1200 Enduro comes from the way Ducati interprets the concept of safety and stays true to the company’s aim to make this motorcycle perfect even when riding conditions are the toughest. Every single component has been conceived with both objectives in mind: from the increased-range 30 litre tank to the steering damper, specifically required by test riders and introduced to maximise stability even on the bumpiest ground. Each technical choice was carefully evaluated by focusing on the rider - and on the rider's safety and comfort. Together with this top-of-the-class motorcycle, Ducati also ensures the support of a network covering more than 90 countries around the world, with 766 between Ducati service points and Ducati dealers. All of which is there to satisfy the needs of those who wish to travel in total freedom and total safety, ready to discover new horizons. All this translates into the Ducati Globetrotter Attitude. 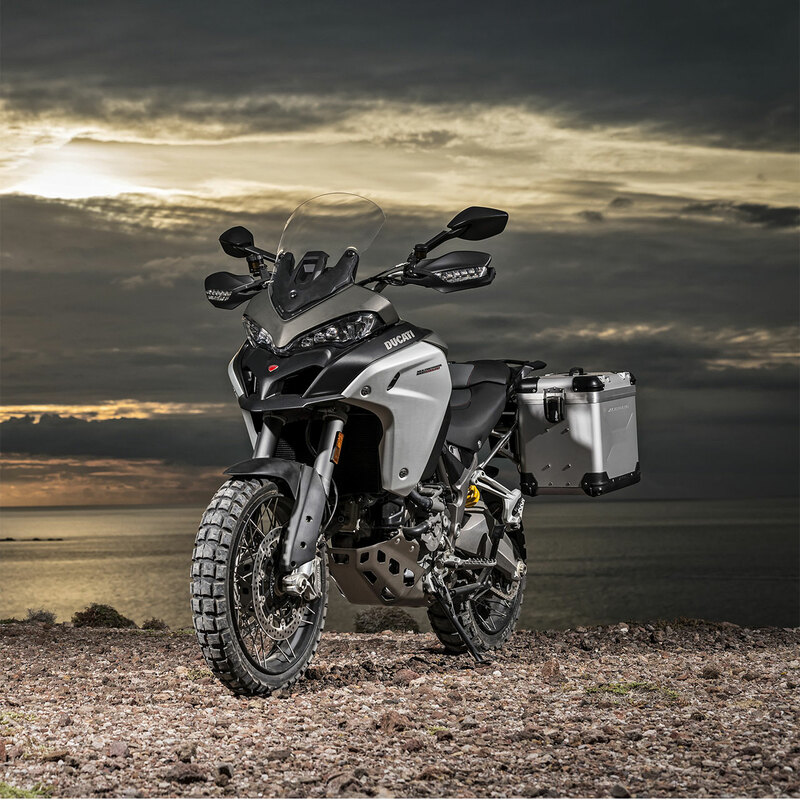 The new Multistrada 1200 Enduro is equipped for adventure in the most remote areas as well as being built to ensure ultimate safety for everyday use. Many features contribute to this aspect. The Bosch Cornering ABS, which allocates braking power optimally between the front and rear, limits braking when leaning through corners so as to ensure effective deceleration without losing grip or unwantedly upsetting the stance. Its 3-level setting is suitable for every riding style, weather or terrain condition. The powerful Full LED headlights complete with Cornering function, ensure excellent roadway visibility as well as lighting of the shadow area on the inside of corners, improving visibility and safety. The new Vehicle Hold Control function makes uphill and fully loaded starts easier, also on slippery ground, by modulating rear wheel braking as the rider operates the clutch and throttle. Semi-active suspension - it helps maintain optimum motorcycle control in any situation and any load condition. Fuel tank, with 30 litre capacity (as opposed to the max. 20 litre capacity of the Multistrada 1200) allowing over 450 km (280 miles) range between fuel stops. Despite its large dimensions, the tank has been perfectly integrated in the overall design of the motorcycle. Aluminium side panels complete with supports, to protect the fuel tank and enhance the typically rugged off-road look. Front mudguard, designed for maximum protection in combination with the new 19" front wheel. Beak, extended in order to improve protection against mud. Mirrors with new aluminium mounts that do not interfere with the rider's arms during out-of-the-seat riding with the rider standing on the pegs. Handlebars whose height gains 50 mm for improved ergonomics in off-road riding. Steering damper to improve control and handling in extreme conditions, allowing the rider to reach the highest levels of performance in the large-displacement Enduro Tourer segment - including in off-road conditions and without affecting on-road performance. Rider seat designed to offer maximum comfort on long-distance trips and at the same time, guarantee the greatest freedom of movement (even during out-of-the-seat riding in off-road use). Passenger seat designed to perfectly integrate with the new rider's seat and ensure maximum passenger comfort. Sachs CDCi front fork offering 200 mm of wheel travel, as well as optimised damping for all-terrain use (as opposed to 170 mm wheel travel on the Multistrada 1200 with damping adjusted for on-road performance). The new forged fork bottom with forward-mounted axle ensures an ideal offset for the multifunctional chassis setup of the Multistrada 1200 Enduro. Sachs CDCi rear monoshock to ensure 200 mm wheel travel as opposed to 170 mm on the Multistrada 1200 and featuring optimised damping for the specific dimensions and the all-terrain use of this model. 19" spoked front wheel to improve handling both off-road and on uneven road surfaces, with an aluminium alloy rim and hub (as opposed to the Multistrada 1200 with a 17" alloy wheel for sports-inspired, enhanced agility during on-road riding). 17" spoked rear wheel with an aluminium rim and hub designed for the double-sided swingarm. 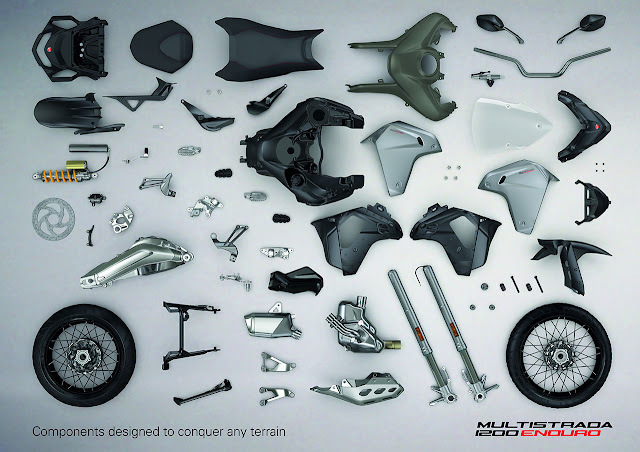 Double-sided swingarm in shell-cast aluminium, able to handle the stress of off-road riding despite its limited weight (as opposed to the Multistrada 1200's single-sided swingarm designed for predominantly on-road riding). Rear mudguard designed to increase protection against debris. Front footpegs made to withstand extreme stress and complete with removable rubber inserts for maximum comfort. They are made of microcast steel to limit their weight (as opposed to being made of die cast aluminium as on the Multistrada 1200). Gear lever features an articulated design to prevent breakage in the event of a fall or impact against an obstacle; unlike the Multistrada 1200's forged aluminium lever, it is made of sheet steel. Rear brake lever is height-adjustable to two positions with an easy release mechanism, adapting to all riding conditions: the uppermost position is easily reached from a backward-leaning, out-of-the-seat position, typical of downhill off-road riding, while the lower position is ideal for road-riding. Also made of sheet steel. Right-hand passenger footpeg mount designed to also support the new exhaust end pipe. Centre stand conceived to integrate perfectly with the new double-sided swingarm without interfering with the typical out-of-the-seat off-road riding style. Side stand optimised for this model's dimensions and offering maximum stability on all types of terrain. Below-seat side panels to protect the lower part of the seat during out-of-the-seat off-road riding. Exhaust silencer is higher-slung – makes crossing water easier - and narrower than the twin silencer on the Multistrada 1200. It has a stainless steel outer sleeve and a compact design allowing the large Ducati Performance by Touratech panniers to be fitted. Exhaust heat shield extends from the pre-silencer to the passenger footpeg mount in order to guarantee maximum comfort for both rider and passenger. Skidplate in aluminium sheet, combined with the new mounts, is designed to withstand the extreme stress of off-road use. Passenger grab handles designed to improve ergonomics and allow for Ducati Performance by Touratech aluminium side pannier to be fitted, thus reducing the overall width of the rear section. Ducati Performance by Touratech aluminium large side panniers available as an accessory. Ducati has given its utmost to the Multistrada 1200 Enduro: its racing DNA and a new, adventurous attitude. Everything, beyond all limits.